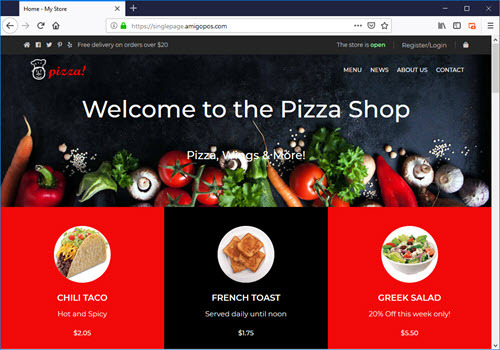 The AmigoPOS online ordering service is a subscription based e-commerce solution based on ASP.Net Core, Web API and Bootstrap that is fully integrated with AmigoPOS. Orders are received automatically at the pos station and both the customer receipt and prep ticket are printed with no user action required. Customer notifications can be sent via email or sms directly from the pos and the order status is available after the customer logs in. The AmigoPOS online ordering service relies on Bootstrap to ensure that the web site is compatible with most browsers and devices. Bootstrap is the most popular HTML, CSS, and JS framework for developing responsive, mobile first projects on the web. Users with knowledge of bootstrap can create highly customized web pages with advanced features such as popups. Sites are hosted on Microsoft Azure cloud server in North America and Europe. Each site runs in a separate application pool so that high volume users do not impact the performance of other sites. The Microsoft SQL Azure Database engine is used to serve data and stores all images, text, menu and site settings. Twice daily backups are performed. At least 2 instances of each web server are running at any given time for maximum availability. Each site is assigned a default subdomain under the amigopos.com domain. In addition, a new or existing domain name can be used by assigning the AmigoPOS online ordering service nameservers in the domain name registrar's control panel. Please contact AmigoPOS support for instructions to assign nameservers for your specific registrar. Order confirmation, order update and other notification emails are sent using Microsoft Azure email services and do not require a separate email account.